It has generally been presumed that Delhi was named after Raja (King) Dhilu of the Mauryan dynasty who reigned in the 1st century BC, and that the various names by which it has been known (Delhi, Dehli, Dilli) have been corruptions of this name. However the earliest reference to a settlement at Delhi is to be found in one of the greatest Indian epics - The Mahabharata - which mentions a city called Indraprastha built around 1400 BC by under the direction of Yudhisthira, on a huge mound somewhere between the sites where the historic Purana Qila (Old Fort) and Humayun's tomb lie today. Delhi has been the capital of a succession of mighty empires and powerful kingdoms; numerous ruins mark the sites of various cities, both ancient and medieval. According to popular tradition, the city has changed its locality a total of seven times although some authorities who take smaller towns and strongholds into account claim Delhi has changed its site as many as fifteen times. The present site of Delhi is bounded by the rocky hills of the Aravalli range in the west and south and on the third side by the shifting channels of the holy river Yamuna. 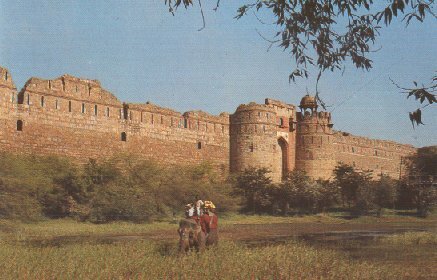 After Raja Dhilu (after whom Delhi is thought to be named) Delhi faced many vicisstudes and did not reemerge until the 12th century AD, when it became the capital of the Chauhan ruler Prithviraj III. After the death of Prithviraj in the late 12th century the city passed into Muslim hands. 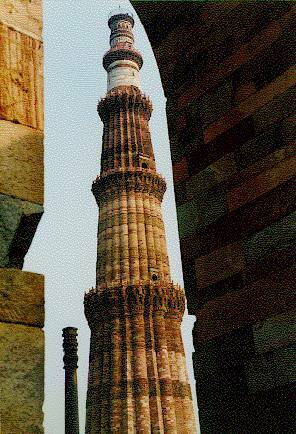 Qutb-ud-din Aibak who started his career as a slave but then rose to the rank of an army general and eventually founded the Muizzi (slave) dynasty chose Delhi as his capital and built the famous Qutb Minar (completed in the early 13th century). To build this minar more than 24 Hindu and Jain temples were destroyed. The Iron Pillar housed in this complex, however could not be destroyed. 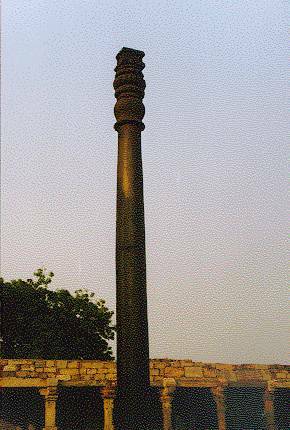 This pillar was build by Samrat (Emperor) Ashoka who ruled around 280 B.C, and is also known by his name (Ashokan Pillar). This simple pillar made of iron, has not rusted in all these years providing a mysterious insight to the developed metallurgical skills in that period. "They say" if you stand straight and are able to wrap your arms around the pillar, completely, your life will be bestowed with good luck. Ala-ud Din Kilji (1296-1316) built the second city of Delhi at Siri, three miles north-east of the Qutb Minar. 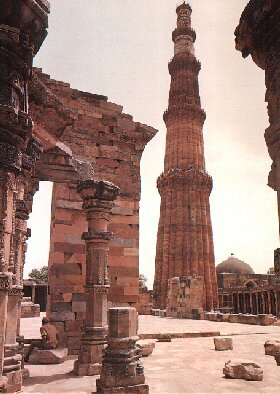 He and some of his successors brought about improvements to the Qutb Minar complex. The third city of Delhi was built by Ghiya-ud-Din Tughlaq (1320-25) at Tughlakabad but had to be abadoned in favour of the old site near Qutb Minar due to water scarcity. Muhammad ibn Tughlaq (1325-51) extended the city further north-east and built new fortifications around it. It then became the fourth city of Delhi, under the name Jahanpanah. Firoz Shah (1351-88) abandoned this site and moved his capital farther north near the ancient site of Indraprastha and founded the fifth city of Delhi, Firuzabad.